Established in 1901, Fleischmanns’ beautiful Skene Memorial Library has an unusual and interesting history. The creation of a community public library in the town (then called Griffin Corners) was spearheaded by a woman, immigrant, and summer resident – Annette W. L. Van der Wegen Skene. Mrs. Skene and her husband Dr. Alexander J. C. Skene lived in Brooklyn and had a vacation home in Highmount, east of Griffin Corners. It was called Bonnie Em, a Scottish-style castle on the slopes of Belleayre Mountain. Mrs. Skene was born in Belgium and Dr. Skene was from Scotland. Between 1894 and 1896 Mrs. Skene helped organize a Library Association. The names of officers of the association featured family names still familiar in the area today. They include DeWitt Griffin, Mrs. T. C. Banker, Mrs. J. J. Blish , Mrs. George H. Lasher, M. S. Keator, Charles H. Vermilyea, Mrs. C. J. Hillis, H. W. Keator, Mrs. J. Biehler, Mrs. George L. Faulkner, and John B. Gregory. Land was donated by local residents, and money contributed by Mrs. Skene and others. 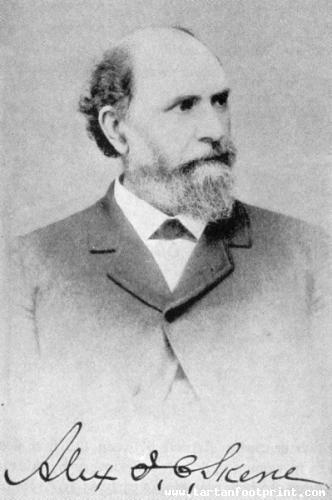 The sudden death of Dr. Skene at his country home in July, 1900, and the subsequent gift of $5,000 from Andrew Carnegie toward the costs of building the library, moved the project forward. The donation from Carnegie was a personal one, and, unlike most Carnegie library funds, did not come with any local funding conditions – only that the library be a memorial to and be named for Dr. Skene, a childhood friend of Mr. Carnegie. The cornerstone for the building was laid in November 1901. In 1928 the building was deeded to the Village of Fleischmanns, and Skene became a Municipal Library. 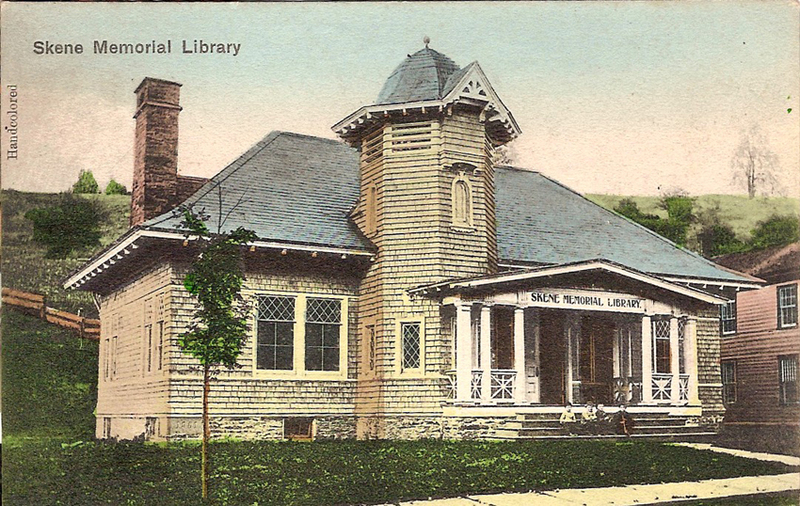 In 2001, in honor of its centennial, Skene Library was placed on both the New York State and the National Register of Historic Places. A special Postal Cancellation was held to observe the centennial. The library building was designed by New York architects Henry and Marshall Emery who were also summer residents and who had also been among the original subscribers. (An intriguing historical tidbit has Mrs. Skene marrying Marshall Emery after the library was completed). It was built by local builder Crosby Kelly. “A frame building, combining elements of the Queen Anne and Shingle architectural styles, dates to the early 20th century. Its exterior incorporates aspects of local train station architecture.” The exterior is described as being “ an L-shaped one-story structure on a stone foundation sided in wood shingles. Four narrow wood moldings run around the eave, lintel, sill and water table levels. The high hipped roofs are shingled in asbestos with broad overhanging eaves supported by brackets. Stone chimneys rise from the west side and the east rear. At the center of the south (front) facade is a porch supported by Doric columns and a wooden balustrade topped by a wide frieze and triglyph with dentilled moldings. The words “SKENE MEMORIAL LIBRARY” are on the entablature. Its overhang is also supported by narrow brackets. Three wide stone steps with iron railings climb up to it. Above the porch is an octagonal tower with round-arched windows in alternating facets above the roofline. Its top stage has louvered vents in all but the front facet, which is sheltered by a gabled hood with a small vergeboard. It is topped by a rounded roof with the same bracketed eaves. “The double wood and glass doors at the main entrance lead into a small vestibule where stairs provide access to the tower and cellar. From there doors open into the main reading room, rectangular with an elliptical arched ceiling. The original plaster walls have been covered in modern paneling; the original hardwood floors remain. Oak and chestnut molding trims the cornice, doors and windows. Two piers separate the main reading room from a smaller one on the west. It was meant to be separated from the main room by partititions that could be pulled down from the piers, but these may not be operational. The west reading room’s main feature is the large stone fireplace on the west wall, with a decorative stone arch in splayed stone and brick. It has a narrow wooden mantel with a shelf supported by brackets and a 10-inch-wide (250 mm) wooden overmantel with decorative carving. Who was Alexander J. C. Skene? Gynecological Society. Dr. Skene was the author of five books and hundreds of other publications on gynecological disease and surgery. He designed many new surgical instruments and famously discovered vaginal glands that are named for him and that are sometimes referred to as the female prostate. 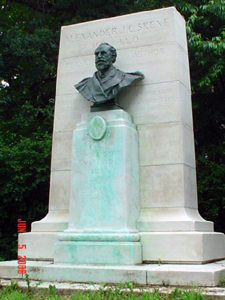 He was thought of so highly by his professional colleagues that a committee of physicians commissioned a sculpture bust statue by the distinguished artist John Massey Rhind that stands near the entrance of Brooklyn’s Prospect Park. A 2014 New York Daily News article mentions Dr. Skene’s memorial in the context of a controversy about a statue of another gynecology pioneer, Dr. James Marion Sims. From testimonials published after his death it is clear that Skene was also a very compassionate man. He was known for treating patients who were unable to pay, and founded a hospital dedicated to the care of working women, Skene’s Hospital for Self-Supporting Women. In addition to his many medical achievements he was a renaissance man: an accomplished amateur sculptor and novelist. His novel, True to Themselves; A Psychological Study was published in 1897. In a medical journal obituary Dr. Skene is described as “of magnificent physique and commanding presence. And yet his touch was as gentle and his nature as sensitive as those of a woman. To see him was to be inspired with trust and confidence.” His portrait can be seen on the west wall of the library, near the children’s reading area. The following sources provided the information on this web page.